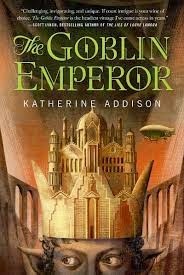 The Goblin Emperor, by Katherine Addison (well-known fantasy and horror author Sarah Monette), is a breath of fresh air. Perhaps all the more so considering the fact that it deliberately eschews the grittier or darker turn to fantasy. Part steampunk and part high fantasy, Addison has written a moving coming of age story of a boy who, after being thrust in to a position of power, begins to find himself. It revolves around the story of Maia, the half-goblin son of Emperor Varenechibel IV who has eked out a rather miserable life in exile, forgotten by the imperial capital and abused by his cousin, Setheris. When his father and three brothers are killed in a tragic airship accident, however, Maia finds himself thrust back into the imperial center. This young adult--at the tender age of 18, and almost wholly unschooled in the politics of the capital--is forced to succeed his father as the next Emperor of the Elves. Surrounded by sycophants and scheming nobles, Maia soon learns that he can trust nobody if he is to stay alive. All the while he yearns to fill one of the most basic needs in life: connecting to people. What is striking about this novel is how much it succeeds without having a compelling story arc. This is a coming of age story that almost reads like a slice of life novel (if there is such a term?). While there are plots against the throne that Maia has to deal with, for the most part the story avoids epic or traditional story arcs. There is no single, great conflict. Instead, it centers on smaller issues, issues we all deal with in daily life: finding friendship, remaining true to oneself, doing the right thing, and building bridges (in this case, both literal and figurative). In the process, Addison ably fleshes out perhaps the most sympathetic and lovable character ever found in fantasy. Readers can relate to Maia. We can sympathize with his pain, and we want him to succeed in life. And we love the fact that he is very liberal, because his progressive views were born from pain and isolation. But The Goblin Emperor is about so much more. It deftly deals with issues of race, gender, abuse in all its forms (physical abuse, emotional abuse, and the abuse of power), the problems of isolation in social life, and the emotional impacts abuse can leave on people's lives. It highlights the difficulty of getting people to accept one another and see eye-to-eye on even the most basic issues. And it does so with a verve and style that I don't often find in the genre. Of course, it does have some weaknesses. The beginning of the novel is replete with infodumping, a pet peeve of readers here at Nerds of a Feather. And some may be turned off by the elvish language Addison invents for the novel. Personally, once I gave up trying to figure out the titles, position, and place names, I became a much happier reader and was finally to focus on the novel's unique strengths. In the end, The Goblin Emperor is a truly rewarding book. It succeeds marvellously as a slice of life novel (or a coming of age novel), one that eschews focusing on a great conflict or a single narrative arc. Instead, it is the minutiae of Maia's daily life, his social struggles, and his incessant worrying about whether he can do the right thing that truly pulls the reader in. Highly Recommended.